You guys, I LOVE this time of year. LOVE. IT. Which... I guess is rather expected considering I live in college basketball country. And I went to college and now work at the greatest basketball school in the history of time. (That isn't just me randomly making such a claim. We are legitimately a contender for BEST OF ALL TIME). So for the next few weeks I will watch as many games as I can. I will run the bracket pool at work and I will cheer on my cats on any social media outlet I can find. I will cry when any underdog wins (as long as it isn't against my cats) because I get EXTREMELY EMOTIONALLY INVOLVED in these games. All of them. If there is the potential for a college age boy to pull his jersey up over his eyes to hide his tears, I am THERE. Actually, it's sorta funny because everyone at work seems surprised I am running the bracket pool. Like, they keep acting shocked about it. Like "YOU are going to do this?? YOU know things about BASKETBALL??" And I keep randomly saying things like "My dad always loved this stuff when I was little so I grew up loving it" or "Nick and I will watch the games anyway, so it isn't a big deal" but all of a sudden I have wanted to say "Is it because I am a GIRL? You know girls can like sports too, right??" I mean, lots of girls are the most die hard sports fans I know. Girls can LOVE SPORTS! GIRLS can do the math and keep track of brackets! GIRLS ARE TOTALLY EQUAL WITH BOYS! Then I get myself worked into a "this is sorta SEXIST" huff before I decide I don't really care that much about people acting sexist as long as I don't have to mow the lawn. So... I guess that's it. I am running my bracket pool at work and I am awesome at it. I love me some Kentucky basketball. I plan to lay around and watch games all weekend while maybe enjoying a green beer on Saturday. How about you? 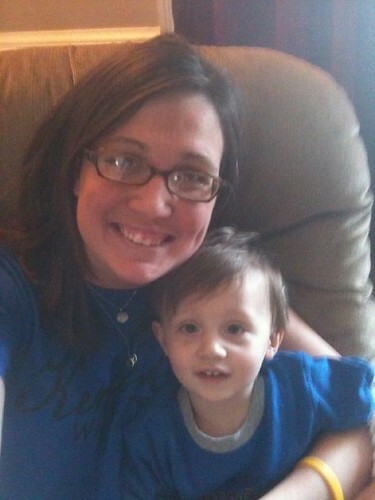 Random, year old picture included because I couldn't find a recent one where were are wearing Blue to cheer on our boys. But last year, this year. No big difference. March= GO BIG BLUE! PS. I am finally really feeling better. Honestly, this time I am serious and not just saying that. YOU are the reason I still root for Gonzaga. Just because they went so far that one year. Ah yes, basketball in KY in March... It really is the best. C! A! T! S! Cats! Cats! Cats! Yes to watching every single UK game. My hubby is a huge UK fan, so he's - of course - amped up this time of year. I think his excitement level was a little higher with last year's team, but I'm sure that will change the further the Cats make it in the tourney. How about that mizzou game?? Whew it wore me out :) and GO CATS! Love this post to pieces..and so glad I started following your blog awhile ago. I am a HUGE college basketball fan from Wisconsin, so I cheer for Badgers though and through. Sweet Sixteen, baby! I, like you, was taught to love the game from my dad, whom I still take time off to watch the games with. I must admit, though, my bracket has MSU taking down your Cats in the Final Four. Sorry. :). Enjoy!